Nothing dates a kitchen like worn worktops, damaged doors, stained grouting, cracked tiles and burned surfaces. But renovating your kitchen and bringing the décor bang up-to-date needn’t cost the earth and could add upwards of 5% to the value of your property. To give you an idea, home makeover experts Granite Transformations have put together some handy hints for updating your kitchen décor. Layout – if you’re comfortable with your layout and its familiar oven-sink-fridge work trianagle, then don’t rip everything out and fit totally new units, with all the expense and disruption that entails. Instead, reface your work surfaces with composite granite, quartz, recycled glass or porcelain composites that fit right over existing worktops and replace cabinet doors with new made-to-measure fittings, leaving the underlying carcases intact. This also means no rewiring or new pipework, cutting installation costs by more than half. Colours – your décor is a reflection of your personality and lifestyle, so a kitchen makeover gives an opportunity to ditch unfashionable or eccentric finishes and explore fresh colour and style directions. Black worktops can become white or bold colours, timbergrain cabinet doors can be transformed into high gloss acrylic and you can add splashes of brightness with glass mosaic panels or an island unit in a contrasting colour. Remodelling means the choice is yours. Storage – even though you’re happy with the basics, your accumulation of gadgets and materials might make extra storage a bonus. Refaced work surfaces and cabinetry enable a new central island unit, extra wall cabinets or a full-height storage cupboard to be integrated seamlessly into your new design. There is also the option of glass-fronted cabinets and drawers for displaying prized knick-knacks or extending a run of base cabinets into a right-angle peninsula end, complete with cantilevered worktops for a breakfast counter. Practicality – if you have laboured in the past with resealing, sanding, treating and polishing stone, timber and laminate worktops, then now is the time to choose a modern, maintenance-free composite material that is non-porous, flame-resistant and withstands stains, scratches, cuts, burns and knocks. Today’s agglomerate granite, quartz and recycled surfaces look like luxurious natural stone, but need just an occasional wipeover to keep their sheen and come in a wide choice of colours. Splashbacks – you’d be surprised how a decorative, yet practical splashback can enhance or transform the look of a kitchen. Choose a regular upstand in the same material to run around the worktops, protecting against dirt and bacteria, a half-height glass mosaic splashback that adds texture and sparkle, or perhaps an extravagant, full wall panel in large tiles or seamless sheeting. Modern, slimline agglomerate and polyurethane-backed mosaics will fit over existing tiles and surfaces, making fitting a breeze. Appliances – with the saving you enjoy from a makeover rather than installing a new fitted kitchen, you should be able to splash out on selected appliances, sinks, taps and accessories to set off your updated décor. The beauty of standard-sized kitchen units and white goods is that new items can be dropped into place with little fuss. So investigate new cooking technology like steam ovens, induction hobs, flush-mounted cookers and built-in microwaves, as well as undermount ceramic bowls and, going back in time, a deep butler’s sink. 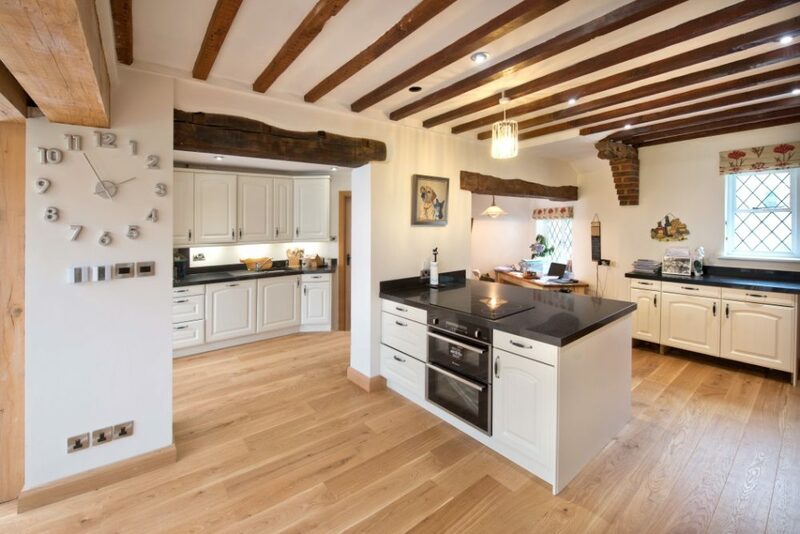 Granite Transformations operates a network of showrooms, each with their own expert designers and fitters, who can carry out these kitchen makeovers and more, often in just one day. Visit www.granitetransformations.co.uk for further details and showroom locations or ring the customer hotline on 0800 044 5393.